You can strengthen your abs without feeling like you're tackling a daunting workout. For some people, crunches and other abdominal muscle workouts are the last thing they'd want to do — so they don't. "Part of the perception is that it's difficult. We tend to want to avoid doing things that require effort, especially as we get older, when that's harder for us," says Lorna Brown, a physical therapist who specializes in geriatrics at Harvard-affiliated Spaulding Rehabilitation Hospital. But skipping abdominal strengtheners can have a big effect on your mobility and independence — and not for the better. The abdominal muscles (often called the abs) include not just the visible "six-pack" or rectus abdominis muscles in the front of your abdomen, but also the obliques in the front and side of your abdomen and the transverse abdominis across your lower abdomen. "The transverse abdominis is the inner muscle underneath the outer abdominal layers. It provides stability around the spine," Brown explains. The abs are part of your core, the collection of muscles that act as your foundation. 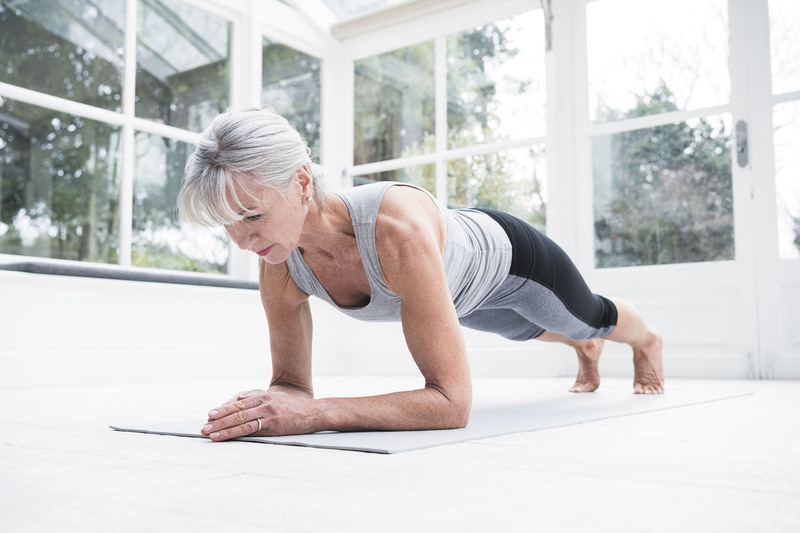 In addition to your abs, your core includes the muscles along your spine, near your shoulder blades, in your hips and buttocks, and in your pelvis. You must work all your core muscles to stay strong and active. "We need that strong core or base so that the arms and legs can perform well," Brown explains. What if you don't mind doing shoulder, hip, and back muscle exercises, but can't stand the ab workout? You're putting your entire core in jeopardy. "If your core isn't stable and strong, you increase the risk for injury and falls when you lift something or walk," Brown says. A weak core also makes it hard to turn, bend, and get dressed. Starting position: Kneel on all fours with your hands and knees directly aligned under your shoulders and hips. Keep your head and spine neutral. Movement: Exhale as you tighten your abdominal muscles by pulling them up toward your spine. Keep your spine neutral (no arching your back!). Hold. Release your abdominal muscles and return to the starting position. Do this eight to 10 times, then rest for 30 to 90 seconds. If you can, repeat the sequence. This is a very subtle movement and your spine should stay still throughout the exercise. Breathe comfortably, exhaling as you pull your abdominal muscles in and up like a zipper. Abdominal exercises don't have to include crunches, and you don't have to do a long ab workout. You may find it more palatable to sprinkle ab exercises throughout the day. "Shorter bouts of exercise can still contribute to better health and function," Brown says. The key is to make each ab exercise count by "activating" the muscles. Can't think of ways to fit abdominal exercises into your schedule? Check out the Harvard Special Health Report Gentle Core (www.health.harvard.edu/gc), and consider the following tricks. Watch TV from the floor. You probably did this when you were a kid. Try it now, and maybe you'll be more likely to do an ab exercise, like modified push-ups (leaning on your forearms instead of your hands). "Or try lying on your back with your knees bent," suggests Brown. "Then activate the abdominal muscles by drawing in your belly button toward the spine." Use phone time. Stand with your back flat against the wall while chatting on the phone. Activate your abs. "Draw in your belly button again, and push yourself against the wall," says Brown. Take a break from work. Whether you're in the kitchen or at the office, you can do a modified push-up against a desk or counter. Don't just stand there. Sneak in an exercise while you stand in line at the bank or grocery checkout. "Do a single-leg stand and slightly lift your leg off the floor while activating your core muscles," Brown suggests. "Keep your chest high and your shoulder blades down and back." March in place. Next time you're brushing your teeth, march in place. "Make it intentional. Draw in the abdominals and keep your hips level, so they're not swiveling," Brown adds. You can even activate the abdominal muscles while you're walking. "Just be very intentional about it," says Brown. Think about posture and muscle activation with each step. The more often you activate your abs, the stronger they'll become, making ab workouts a lot less daunting.